(Photo by Darren Andrew Weimert) Brian Allen holds a sketch of Gritty in his Bellefonte studio. (Courtesy of Philadelphia Flyers) Gritty has evolved from Allen's drawing into a hit on the ice in Philadelphia. 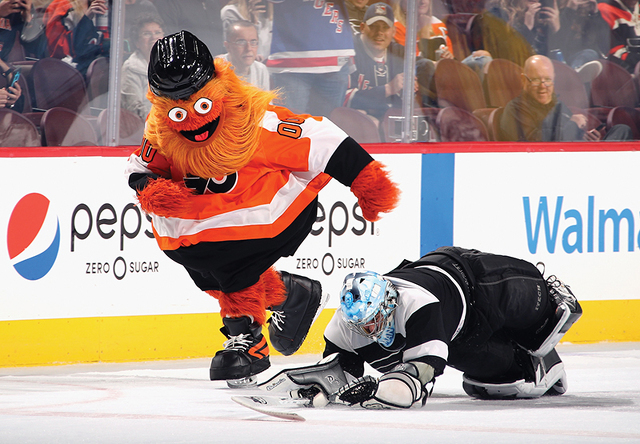 Brian Allen created a monster, both literally and figuratively, in Gritty, the new mascot of the National Hockey League’s Philadelphia Flyers. Gritty is a big, orange, hairy monster on skates. And he is an even bigger monster on the Internet, with a strong social media team that shares his antics with fans around the globe. 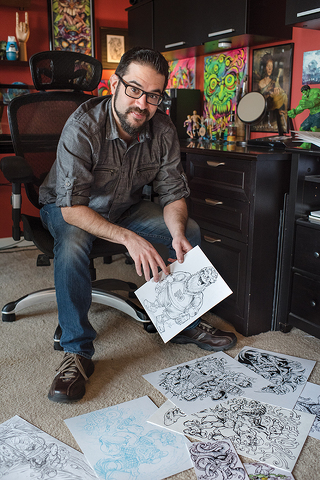 Allen, an independent graphic designer and illustrator who is a State High and Penn State grad, drew up Gritty right here in Centre County at his home office in Bellefonte – and he’s been on the ride of his life ever since. The first reactions to Gritty weren’t exactly positive. When he was introduced prior to the Flyers’ last season, many said they found him a little off-putting. After all, the Flyers are a throwback team, and they didn’t have a mascot. Some people weren’t sure they needed one. Gritty’s googly eyes, his giant smile with his tongue sticking out, and his long, unkempt, orange hair was a little much for many people at first glance. “An Apocalypse Muppet,” was one of the tamer insults that unfurled across the Internet during the first few hours of his social life, but Gritty took the insults in stride, offering witty responses and snappy comebacks to all the chatter. In Bellefonte, Allen took it all in. The first few days of Gritty’s launch were a roller coaster of emotions, and the ride hasn’t really stopped. Allen got to see the mascot that came from his drawing at the same time as the rest of the world. It was exciting for the artist to see his creation come to life – and a little nerve-racking. After the launch, Allen got back to work on other projects. But Gritty grew larger on social media, as people kept commenting on the new mascot. That initial high of seeing his work come to life quickly crashed. Maybe people wouldn’t like Gritty. “Some people that I know started messaging me and stuff and saying, ‘Check this out,’ and ‘Congratulations.’ But there was one comment on my feed that said something like, ‘Not everybody is a fan.’ I saw that, and I was like, ‘Oh, what does she mean?’ I hopped over to the Flyers Facebook page and I started reading one comment, and then another, and another, and each one was pretty negative,” Allen says. He began to worry that maybe the Flyers would pull the mascot. Allen called the art directors to check in and he was assured that this was just the type of reaction that the creative team for the Flyers was expecting, and they were ready for it. To get away from the negativity, Allen says he avoided social media for a few days and focused on his work. Then, something strange happened: Gritty blew up in popularity on the Internet. Allen’s Gritty roller-coaster ride started to head back up, and it hasn’t come back down. Allen started getting messages from fans. He was invited to Gritty fan club groups on social media. The local media started calling to ask about his creation. His kids were asked at school about their dad’s creation. And many creative people started sending him fan art. “Someone sent an Etch-a-Sketch drawing that they did of Gritty and it was like fine art; it looked amazing,” says Allen. He received pictures of Gritty cakes, Gritty tattoos, and, of course, Gritty memes. “The tattoos, that when I knew he had staying power, because that’s forever, right?” Allen says. For Gritty to be a true embodiment of the Flyers, he had to be able to show some true grit in the face of a little adversity. He fired back at his critics on social media in the most perfect way possible, proving to be the perfect embodiment of Philadelphia’s blue-collar charm. At the Flyers’ first game, Gritty came out and promptly slipped on the ice, and Twitter went wild. Later, Gritty got his hands on a T-shirt cannon and did what he has grown accustomed to doing: He fired back at the poor marketing person who was shooting T-shirts into the stands. Again, the Internet went wild. People across social media have continued to embrace this manic mascot. He is the subject of memes and YouTube videos. Gritty’s reach has gone beyond Philadelphia or even the NHL. Gritty truly has gone viral in so many different ways. “You could feel the momentum shift. The marketing team and the guy who is inside of Gritty were really doing all the right things and embracing the reaction and fighting back,” says Allen. “It was all that creative thinking that won people over and now it’s crazy because if you look at Gritty’s Instagram feed, it is all positive comments. Allen understands that some of the positive reaction to Gritty is “ironic” in nature, but he is glad to know that Gritty is successful in that way. Allen comes from a family of artists. His grandmother and great-grandfather were artists, and he says that where some kids are discouraged from the arts when they are young, Allen’s family encouraged his artistic ambitions. Both Allen and his brother work as professional artists. While at State High, Allen spent most of his free time drawing, practicing, growing, and getting better. He was encouraged by art teacher Robert Placky to continue his work. “I can’t remember a point in my life where I thought of doing anything else, which doesn’t mean it was a calling or anything, but it was something that I was the best at, and I wasn’t even very good until three years ago,” Allen says. After majoring in advertising at Penn State, Allen just wanted to illustrate once he got out of school in 2004. He eventually got job at a motorcycle company doing illustrations of skulls. After he got married and started a family, he took a job at Jostens in State College. Then, in 2012, he made a big jump and started working on his own, hustling as a freelancing artist. He says technology allows him to work with clients all over the world and enables a freelancer like himself to make it in Centre County, where there wouldn’t have been enough work in the past. Scary, because he isn’t always sure what the next job is going to be, or if a client is going to choose him for a project after he creates concept work. But things seem to be going pretty well. His wife, Lesha, helps him run the business these days as the two juggle that operation with two young children. Sitting in his home studio in Bellefonte, a visitor sees Allen’s work come to life. The colors are vibrant and the 1980s and 1990s kid who was inspired to create comes out in his art, which is plastered around the room. The characters feel alive on the wall, and Allen’s designs feel stylish and creative. There is an edge to his art, but also some humor at the same time. His business, Flyland Designs, has been getting more calls since Gritty broke out, and while not all of them have panned out, he is glad that people are noticing his work. It is funny that Allen’s best-known creation is for a professional sports team, because he is not a huge sports guy. But as a freelancer, he is very good at putting himself in a client’s shoes and working to create that client’s vision in his art. For Gritty, he needed a creation that would appeal to children, but, at the same time, not be so cute as to turn off hockey fans, some who are a little rough around the edges. The Flyers found Allen after he had created characters for a Chick-fil-A Peach Bowl promotion. Before he started drawing, he studied different mascots to see what would work and to make sure that his creation would not be a copy of other mascots. After drawing for two days, he submitted 25 sketches ranging from different animals to people to “weird stuff,” and the creative team chose Gritty. Besides finding the cute and scary balance the team was looking for, Allen had to keep the drawing practical enough that they could actually make a costume out of it. Allen no longer owns Gritty; he is the property of the National Hockey League. This past season, the Flyers brought Allen and his family out for game and Allen finally got to meet the embodiment of his creation face-to-face. His son, Michael, and daughter, Bella, were excited to see their dad’s work in real life, and Allen was amazed how the details from his pages transferred to 3-D.
Allen’s sketch was everywhere that night, on the shirts of kids in the crowd and all over the gift shop. “It was pretty wild. I have never been in a situation like that were I went into a stadium and my art was literally everywhere. It is crazy,” he says. Because he knows the man who plays Gritty by name, when they met, Allen committed a big faux pas by saying his name and asking how he was. “Gritty just looked around the room as if he didn’t know who that person was. He stayed perfectly in character; it was great,” Allen says. The crowd reacted every time Gritty came out during the game and Allen couldn’t help but feel good that his creation brought happiness to so many people. Allen doesn’t think he will ever design anything as big as Gritty again, but he’ll continue to draw at his desk and take calls, because he never knows when the next monster project might come along. Vincent Corso is a staff writer for Town&Gown and The Centre County Gazette. Vincent Corso is a freelance writer from State College.